FabFilter Pro-Q 3 is another major version of the Pro-Q equalizer plug-in, featuring dynamic EQ, per-band mid/side processing, new brickwall and flat tilt filters, external spectrum visualization with collision detection, surround support and much more. This update is for anyone who purchased Pro-Q 2 or 1 before September 29, 2018! This is the absolute best EQ available out there. Gorgeous looks, clear and transparent sound. Can be used on individual channels, buses as well as a great mastering EQ. I think you don't need any other (transparent character) EQ if you have Pro-Q 3. Must have for every home studio! 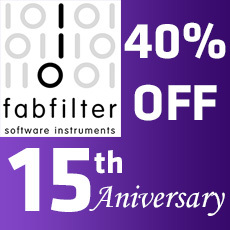 Thank you so much, FabFilter and Best Service! I highly recommend them.